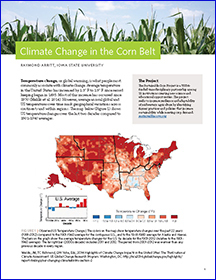 Climate changes and extreme rain and heat/drought events pose significant challenges to the corn and soybean economy in the Midwestern U.S. In the last decade, the intensity and frequency of droughts and floods in the region have increased, with a record loss of 4 billion bushels recorded in 2012. Farm-level adaptation to climate change is a suitable process of adjustments to potential current and future weather variability. Understanding farmers’ attitudes toward their individual and collective efforts to protect land from increased weather variability can provide valuable lessons for agriculture and climate policy makers and agricultural advisors. 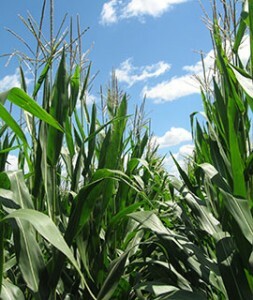 In 2012, a farmer survey carried out by the Sustainable Corn Project (USDA-funded project) in partnership with the Useful to Useable (U2U) project asked 4778 corn farmers from 11 Midwestern states about adaptive responses to increased weather variability. In general, most respondents believed that farmers should take steps to make their operations more resilient (click here to see the fact sheet). One thought-provoking result shows that two-thirds of respondents across all states agreed that farmers should take additional steps to prepare for increased weather variability. According to the survey, a majority of farmers are viewing farm-level adaptation as a necessary step for future sustainability of their farms. Farmers’ attitudes toward responses to increased weather variability varies across a diverse social and biophysical landscape. For improved understanding of this multiplicity, the farmer survey was stratified by watershed, with random samples of farmers drawn in each of 22 HUC6 watersheds. Watershed-level data can help to inform localized outreach programming. The survey data shows that while 58% farmers agreed that they as individuals should take additional steps to protect land against risks posed by increased weather variability. The level of agreement varied across watersheds, from a low of 47% in Loup watershed (Nebraksa) to a high of 70% in Kaskaskia watershed (Illinois). Higher levels of agreement toward responses to increased weather variability could suggest that more farmers are willing to support adaptive actions. What’s up with El Nino? What’s up with El Nino? Short answer is still not too much. The monthly El Nino summary has been posted today at the Climate Prediction Center (see link below). The basic message is that reaching El Nino conditions is still likely (now 58%) lower than last month. Conditions in the Pacific are still not coming together well in the coupling between ocean and atmosphere. Sea surface temperatures are relatively warm. The long range outlooks still are based on El Nino conditions occurring (updates will come out in 2 weeks). But the weak El Nino would allow other variables to impact what happens this winter including changes in the North Pacific, North Atlantic and over the pole. End result is that some things that look like El Nino are still likely to happen during the winter. But the confidence of being a very warm winter in the northern US is somewhat less. The likelihood is lower because of the reduced El Nino chances. And even if El Nino does occur, weak El Ninos have less overall influence and can more easily be modified by other conditions.